This fascinating book examines the concept of culture from a unique perspective--that of individual occupational therapists who have worked in environments very different from those in which they were educated or had worked previously. In Occupational Therapy Across Cultural Boundaries, six occupational therapists relate their experiences living and working in a foreign culture. Each author describes the daily demands placed upon her through immersion into a different way of life and discusses the environmental challenges she had to overcome to be able to live and work successfully. Many of the cultural differences the authors faced forced them to reassess and reconstruct their most basic assumptions of both personal and professional life as they discovered that activities and theories common or applicable in one culture are not necessarily translatable into another. The authors also analyze culture across treatment areas in occupational therapy practice, including mental health and physical disability, with both adults and children. Both beginning and experienced occupational therapists and occupational therapy students will find much valuable information in Occupational Therapy Across Cultural Boundaries. Whether interested in examining occupational therapy's application to non-Western cultures, or actually contemplating practicing in a different culture, readers will benefit from learning about the experiences of the authors. 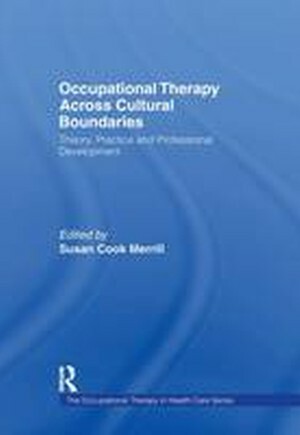 This unique book is also helpful for occupational therapy students wishing to examine the philosophy of occupational therapy or the significance of culture to human occupation. Professors will find it useful as an ancillary textbook for undergraduate and graduate courses in occupational therapy on topics such as theory, occupation across cultures, or meaningful activity.